The Marshall MX212R is the perfect complement to your DSL head or 2 x 12" combo. This 2 x 12" extension cabinet is loaded with twin Celestion Seventy 80 speakers, which yield a muscular British sound with robust mids and gut-punching top end. Hook it up, and you'll experience deep bass, smooth mids, colorful highs, and epic power handling. No matter what style of music you're playing, the MX212R will bring out the best in your amplifier. 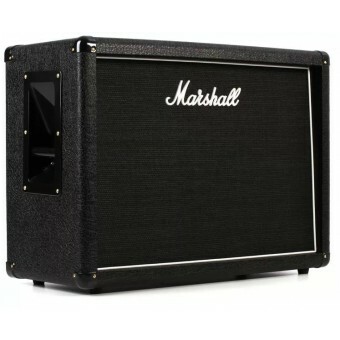 Complete with the iconic Marshall logo, the MX212R is a great way to expand your DSL's capabilities. Celestion's Seventy 80 gives you modern British tone with gutsy midrange and plenty of top end punch. Celestions are a staple of modern music. Starting in the 1960s, they helped define generations of guitar tone. The Seventy 80 takes the sound of Celestion's classic original G12M Greenback ceramic speaker to the max. Characterized by its hefty bottom end, aggressive mids, crisp highs, and robust volume handling, this speaker sounds great no matter what style of music you play. When we're searching for a modern Brit-flavored speaker here at Sweetwater, we reach for the Seventy 80.